“Yamaga Lantern Festival” is a summer scenary that continues from ancient times in Yamaga City, Kumamoto Prefecture. 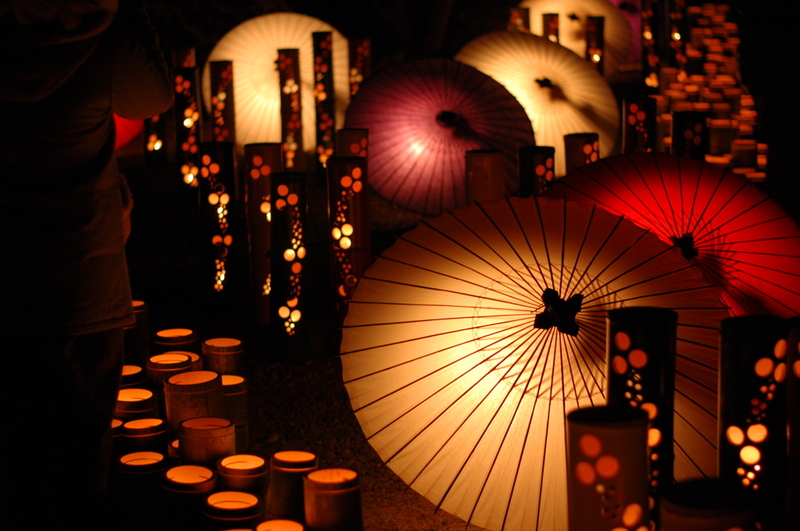 Every year on August 15th and 16th, the beautiful lanterns flicker on Yamaga night. A beautiful “golden lantern” made only of Japanese paper and paste is raised above the head, and the “Yoheho-Bushi” (A Folk Tune of Yoheho) known as the “Yoheho-, Yoheho-” hangs on Yamaga night. Women in “golden lantern” in a yukata figure. Especially, the beauty of “Thousand people lantern dance” is deprived. 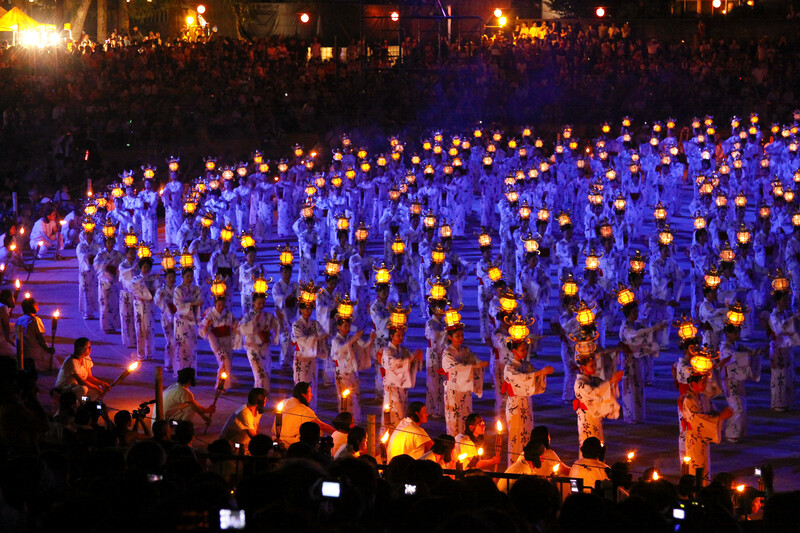 In particular, you will drink in the beauty of “Thousands of people lantern dance”. Yamaga lanterns called “golden lantern” which women put on their heads are also called artworks of Washi (Japanese paper). In addition to the golden lantern, there are various styles such as “Miya Zukuri Style”, “Shinden Zukuri Style”, “Shiro Zukuri Style”, but the common iron rule is not to use any wood or metal fittings, even the most part is made with paper only. Yamaga lantern is recognized as a national traditional craft in 2013. It is “Thousand people lantern dance” that the Yamaga lantern festival shows the highest excitement. 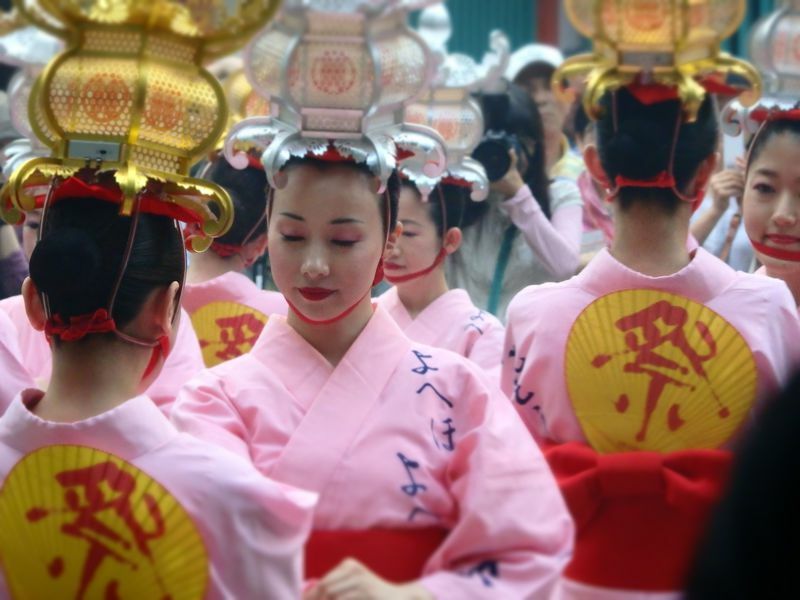 Women who have a golden lantern on their heads will enter the venue, the ground. “Thousand people lantern dance” is a two-part system, the first part is from 18:45 to 20:15, and the second part is from 21:00 to 22:00. A lady of white clothes appears in the turret in the center of the venue where the lights are extinguished, and a flute is blown. Women of dancers enter along with the flute sound. The venue is enveloped in a mysterious atmosphere at once. The golden lanterns glow a little in the dark, it is a fantastic sight. A long time ago people of Yamaga picked up a torch with Emperor Keiko who was stuck because of fog. Since then, Yamaga has enshrined the Emperor every year and started to offer a torch. In the Muromachi period, it began to dedicate lanterns made of Japanese paper, which is said to have been the origin of the festival. The “Yamaga Toro Matsuri” (The lantern festival) is held every year from August 15 through 16th in Yamaga, Kumamoto city area. On 15th, the “Hono Toro” (the dedicatory lantern), which modelled Shinto shrines Buddhist temples and castles, is displayed in each town, including “Hono Toro Odori” (the dedication lantern dance) by the Yamaga Lantern Dance Preservation Society, and the fireworks of approximately 4,000 setting off at Kikuchi-gawa river are held. 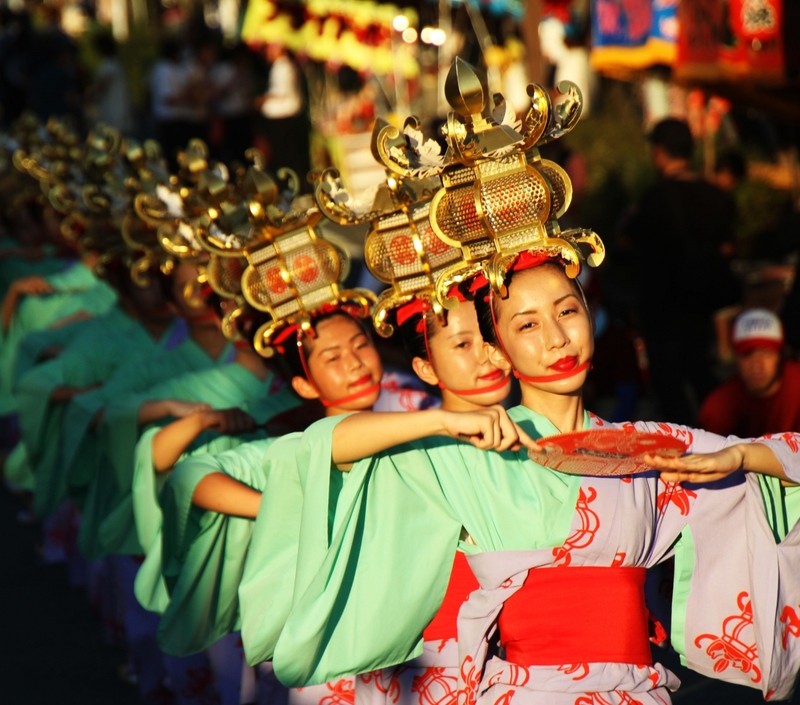 “The welcome ceremony of the Emperor Keiko” which is the origin of this festival is held on August 16. 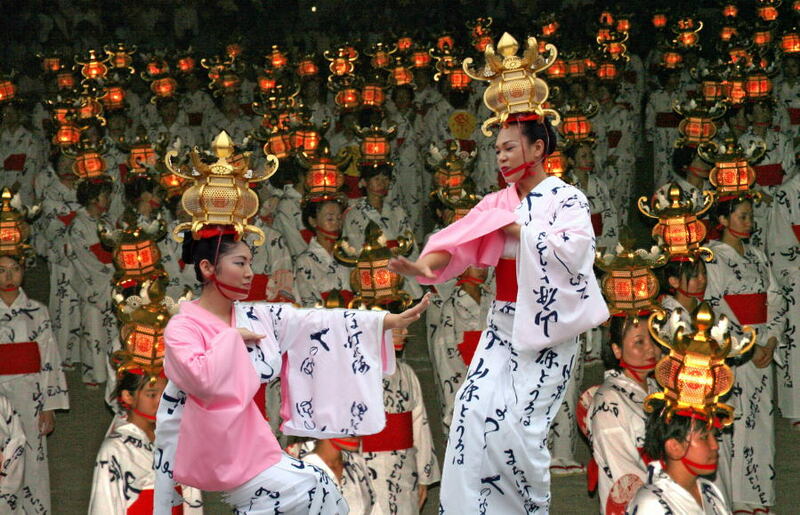 Other than “Taimatsu Gyoretsu” (a torch line) to parade around the city having a torch, the fantastic “Sen-nin Toro Odori” (1,000 lantern dances), that women dressed in the yukata and put the golden lantern on top of their head dance elegantly, are held. The origin of this festival dates back to the times of “Kojiki” and “Nihon-Shoki” (collections of the classics in Japanese literature, called ‘Records of Ancient Matters’ and ‘Chronicles of Japan’). When the Emperor Keiko was traveling, the thick fog disoriented him. Then people of Yamaga raised a torch and showed him the way, and invited. Thereafter they worshiped the Emperor, and dedicated a torch every year. It is said that this event is the origin of “Yamaga Lantern Festival”. Women putting on “Kana-Toro” (Metal Lantern) made with Japanese paper dances in the Yamaga Lantern Festival. Because this “Kana-Toro” is made of paper, it is very light, so they seem to forget putting. The “Agari-Toro”, which male servants carry decorated dedicatory lantern on their shoulders and go to Omiya Shrine, is a climax of this event. 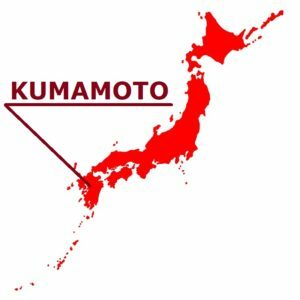 More than approximately 300,000 people in and around the Kumamoto-city have come to see this festival that is outstanding summer feature in Kyushu. There are also seats for a fee.